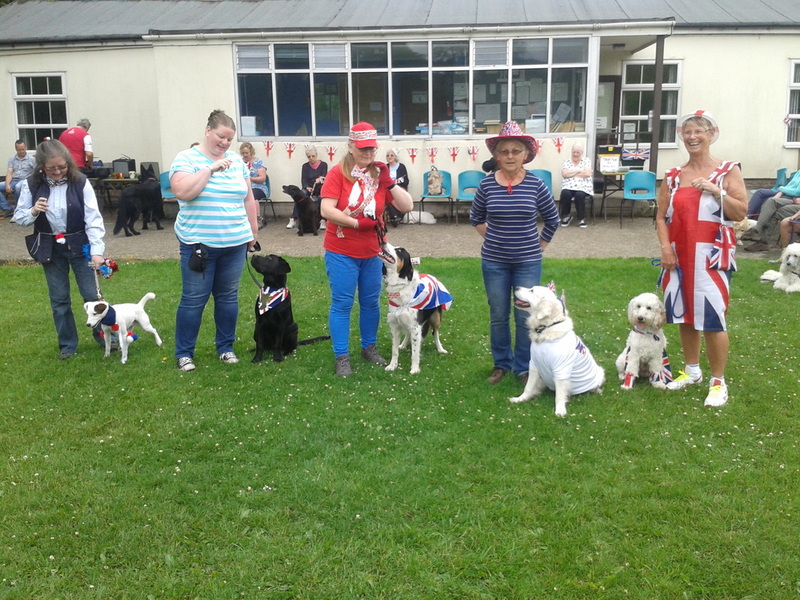 Well what a really busy year we have had with our school, this being our 20th year we have seen many previous pupils with new puppies it has been lovely to meet up with them again along with many new pupils with their pups. 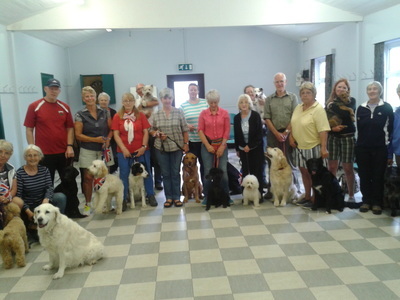 The intermediate class has been very popular and we enjoy helping the rescue dogs with their new owners. 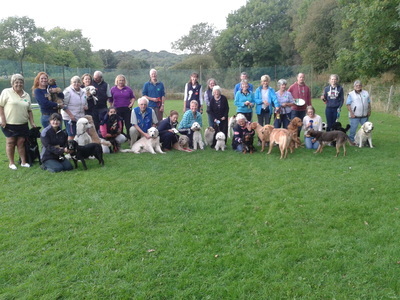 We started a new beginner class in the summer and this has worked out really well. The competition class has been extremely good with all our pupils achieving success, we also have some new pupils ready to join them next year, very exciting! 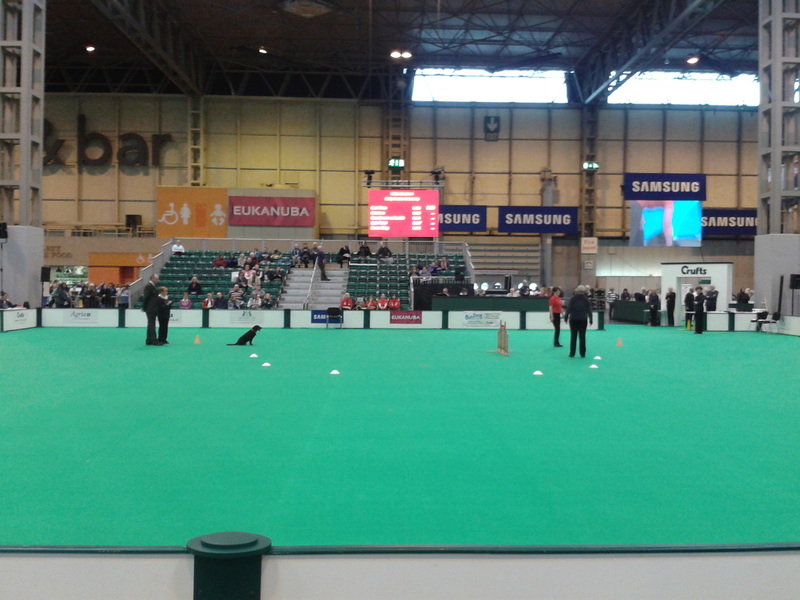 Crufts in March was a great success for Emma and Barney; its lovely to see our pupils working their dogs on the green carpet as I have done in the past. 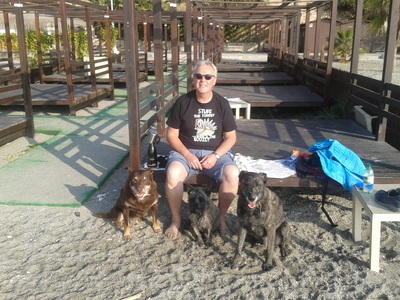 ​Unfortunately we have had to say a sad goodbye to some wonderful dogs, our Dingo, Anne`s Barclay and Megan`s Purdy, all very much missed but we have such lovely memories of them all. ​Colin and I would like to thank all our pupils for their continued support in everything that we do, we enjoy all of our classes very much. 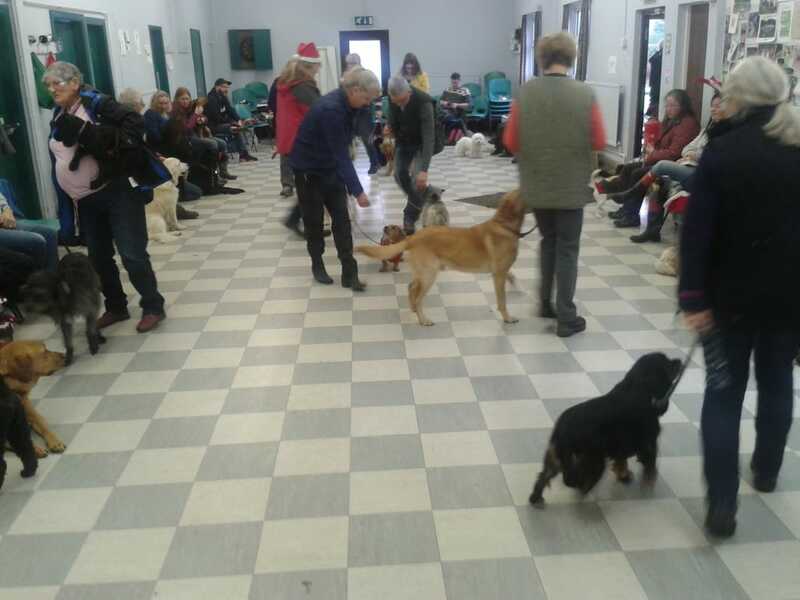 ​We are currently enjoying our winter break in the sun and we will be back soon with renewed energy for another wonderful busy year training all your wonderful dogs. 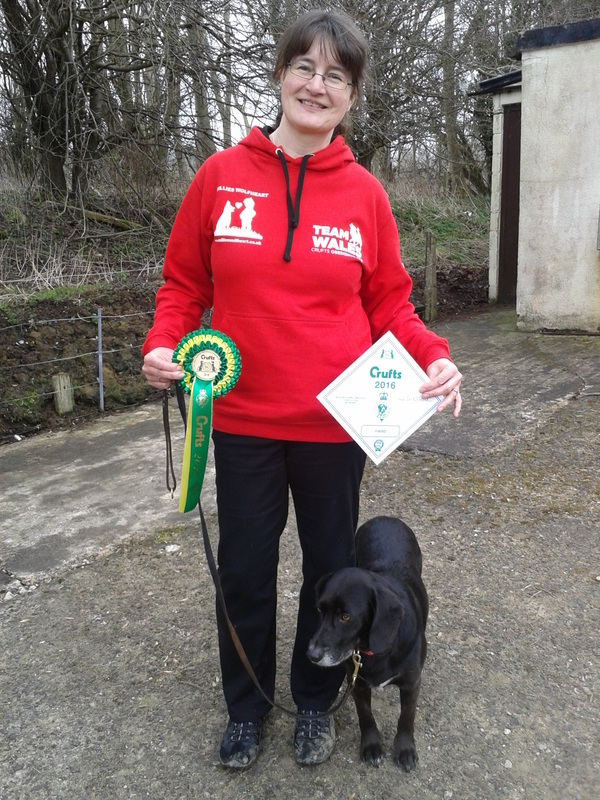 ​WE HAVE GREAT NEWS THAT CAROL AND RAFA HAVE EARNED A PLACE IN THE WELSH TEAM AT THE INTEREGIONAL COMPETITION AT CRUFTS IN MARCH. WE LOOK FORWARD TO HELPING THEM PREPARE FOR THIS WONDERFUL EVENT AND SUPPORTING THEM ON THE DAY. ​We had been collecting for several weeks, all our pupils were very generous. We also had a collection of money which added up to £100, this is fabulous. 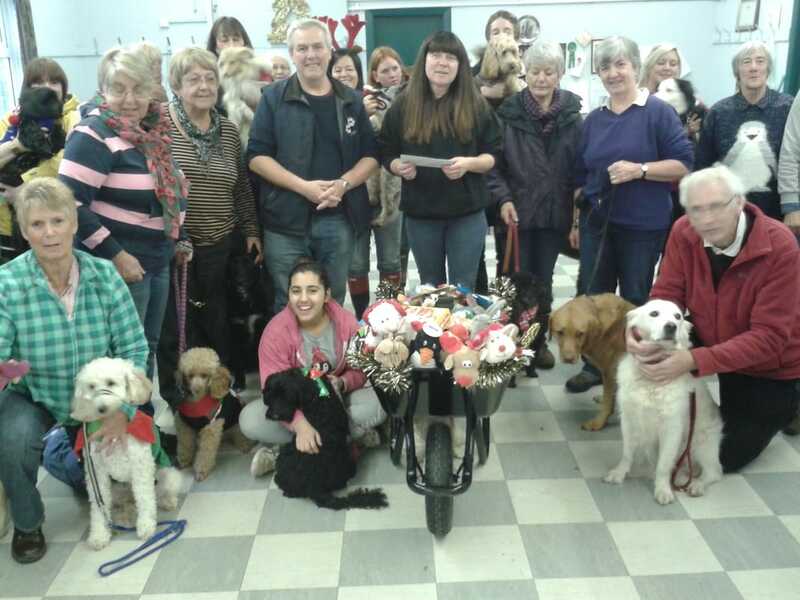 The secretary of NCAR attended at our party to accept our donation and met all the people and their wonderful dogs. 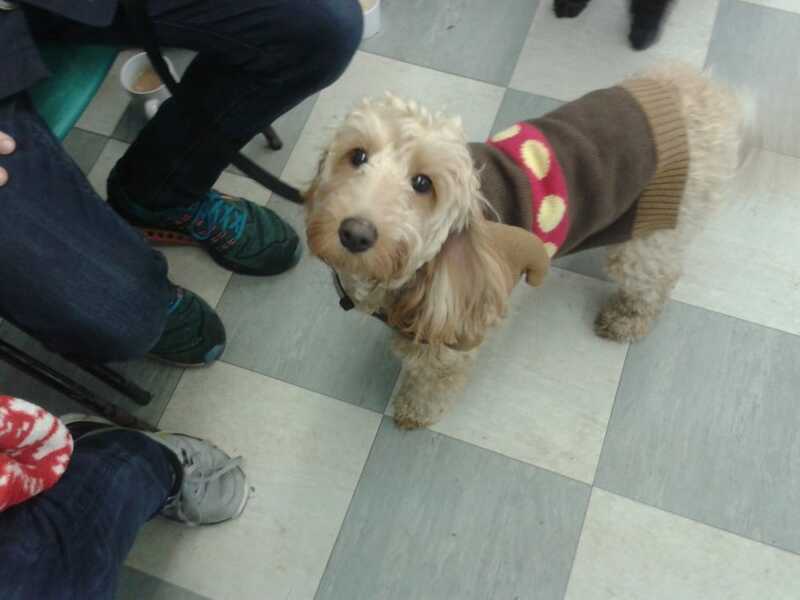 A great time was had by all at our dogs Christmas party, the dressing up was extremely good, a lot of effort was made by many of our pupils. 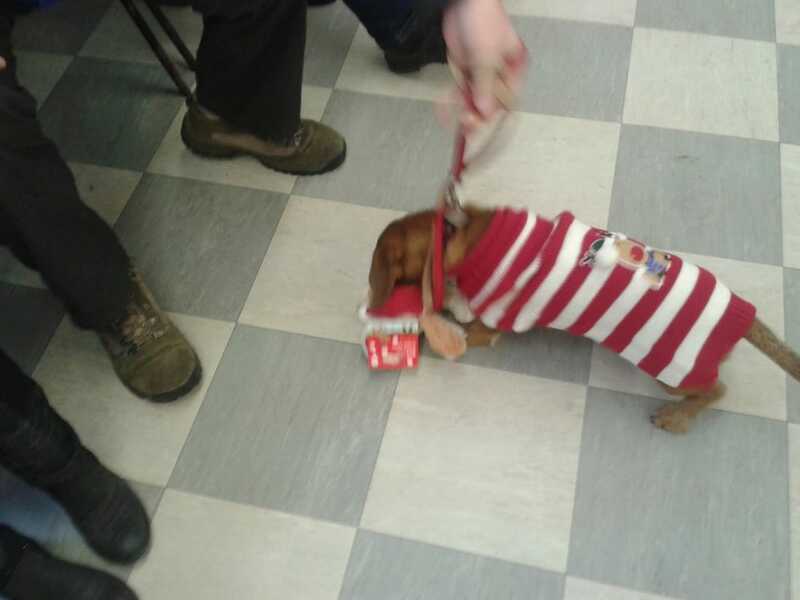 We had a few games and ended with chuck a sausage which is everyones favourite, prizes were handed out to everyone. ​Anne will be running the classes until we return from our winter break. 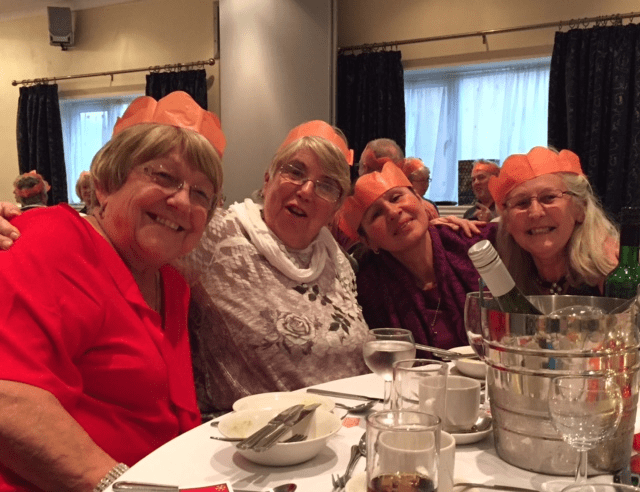 Yet again the Beaufort Hotel provided a lovely meal for our annual get together, we thank all our friends who provided entertainment for us to enjoy. A great time was had by all. JOAN AND JOSIE - Who has been a great support for her mum this year. 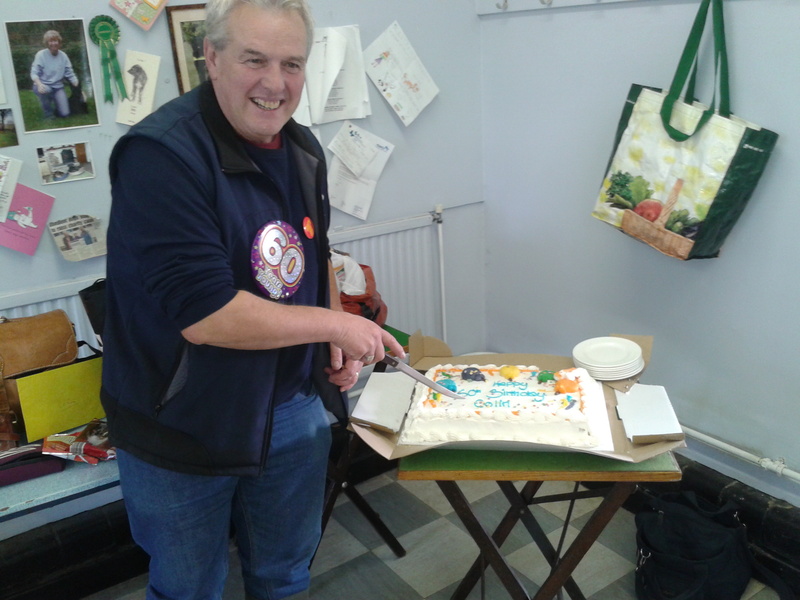 ​This has been a really good year for our competition group, lots of prizes and cakes! ​We wish you all the very best of luck for next year and look forward to the rewards. THIS WIN TAKES WENDY OUT OF BEGINNERS FOREVER! ALL IN THE SAME CLASS! 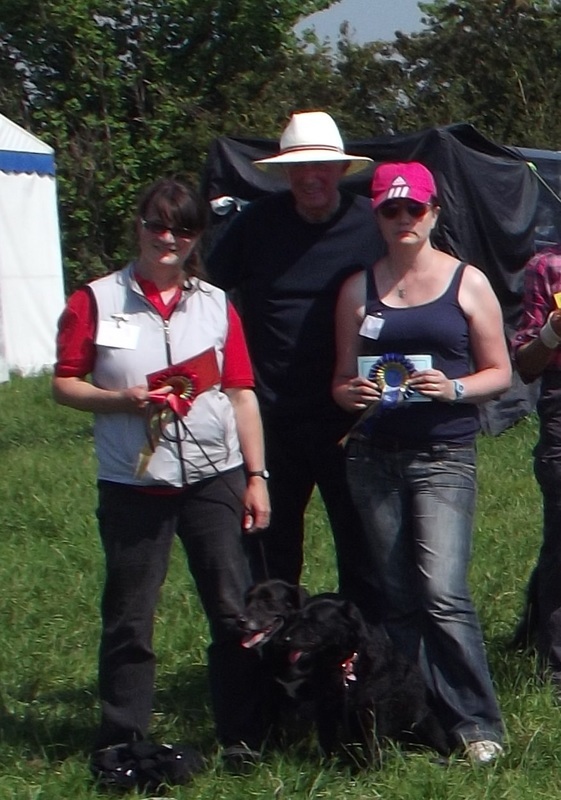 This was Craigs first time in the ring and the judge thought they were wonderful. What a fabulous first year of competing you both have had with lots of places and now this wonderful win. We have had another wonderful day at our Autumn progress test where all pupils compete against each other for rosettes and trophies. 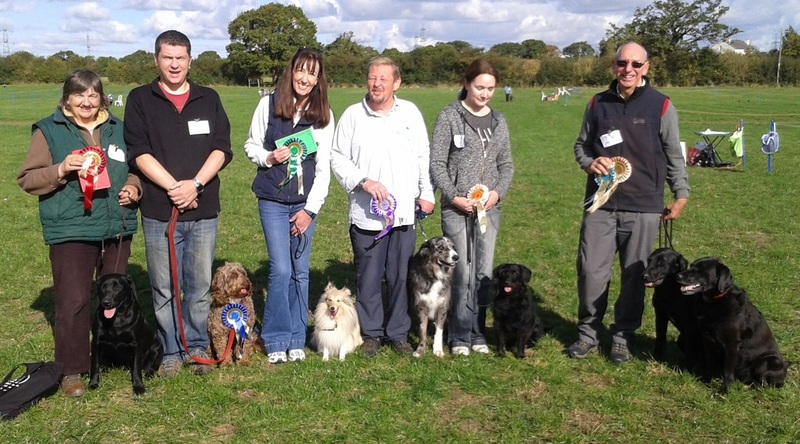 Everyone put on a good performance with their dogs and we all enjoyed the day. It is once again with a heavy heart I have to report the passing of another wonderful dog Perdie. Our good friend Megan took Perdie in when she was 4 years old, we then discovered that she and our Guy were siblings which was amazing! They formed a lovely relationship and Perdie helped Megan through a very tough time, they loved to walk the lanes and run in the fields and we often joined in the fun with them. 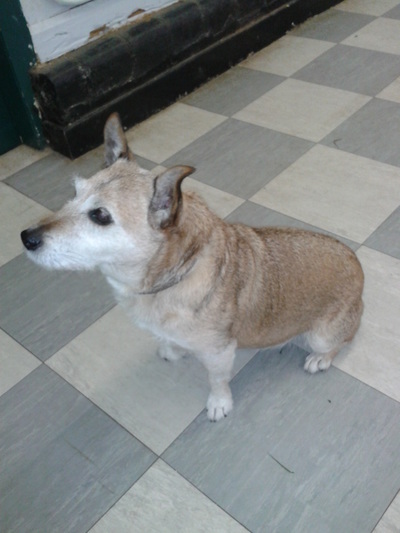 Perdie also became part of our family and we loved her dearly. A lump was found and cancer spread very quickly, a week before her 9th birthday we had to say goodbye. 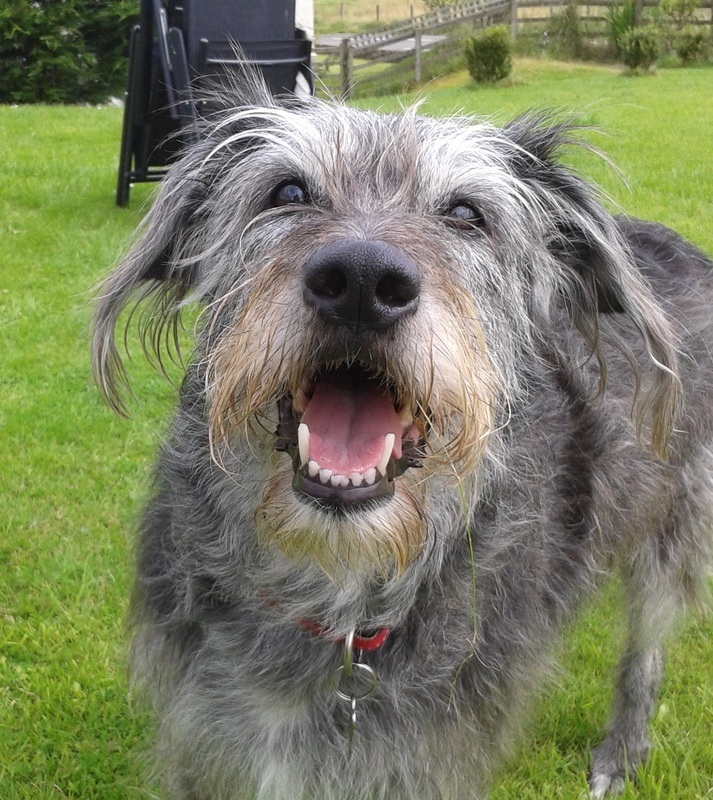 Perdie was a very happy loving dog, we all miss her and will never forget her laughing face. ​Always in our hearts till we meet again. With sincere sympathy and love to our friend Megan. DAVE AND THE AMAZING EBONY AT 10 AND A HALF YEARS OLD! It just goes to show persistence pays off! Ebony has been kind of semi retired since Gelert came onto the scene but she had other things in mind to show him who is top dog!! Your lovely skye and now Ebony both winners. We are both very proud of all you have achieved with your dogs. ​That red one is not far away, keep up the good work. 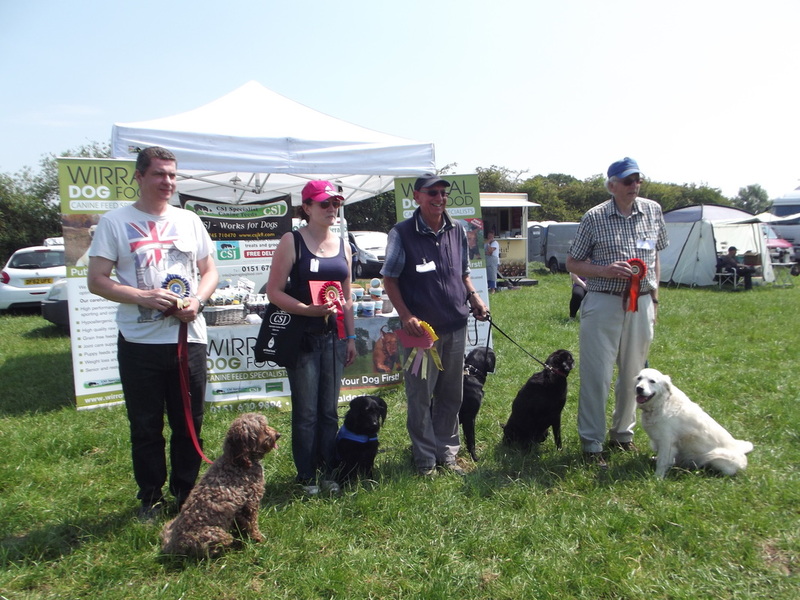 Another fantastic day at Danesford dog show. What a result for our wonderful competition class, don`t forget the cakes Emma! 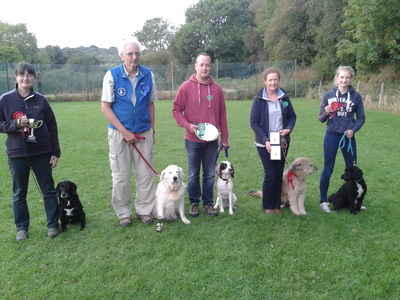 ​at Lune Valley dog show. 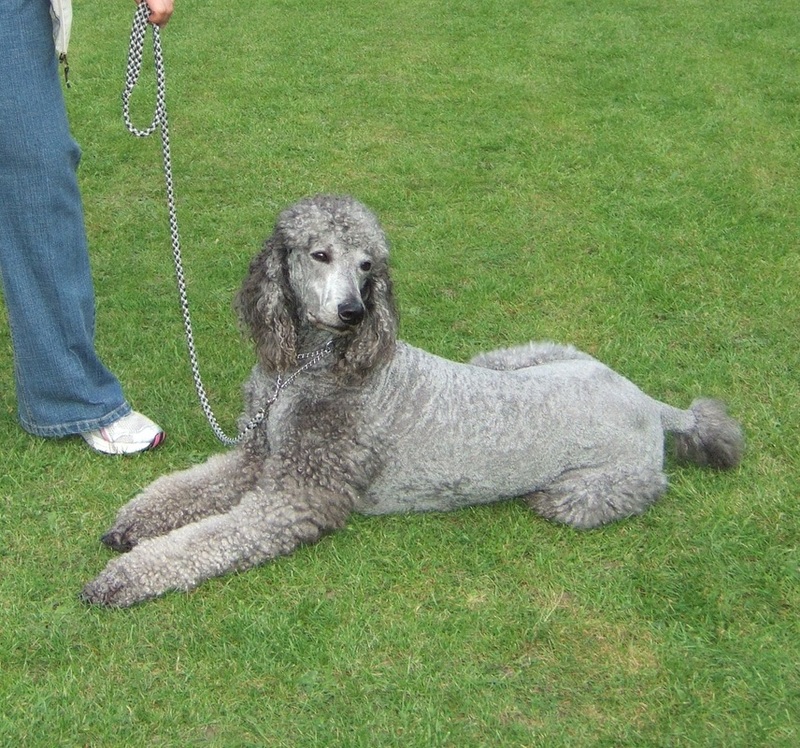 He was their first standard poodle after Bella a mini poodle and he started a real passion for the breed with Lloyd and Curtis following on behind, then Lulu a mini from rescue. 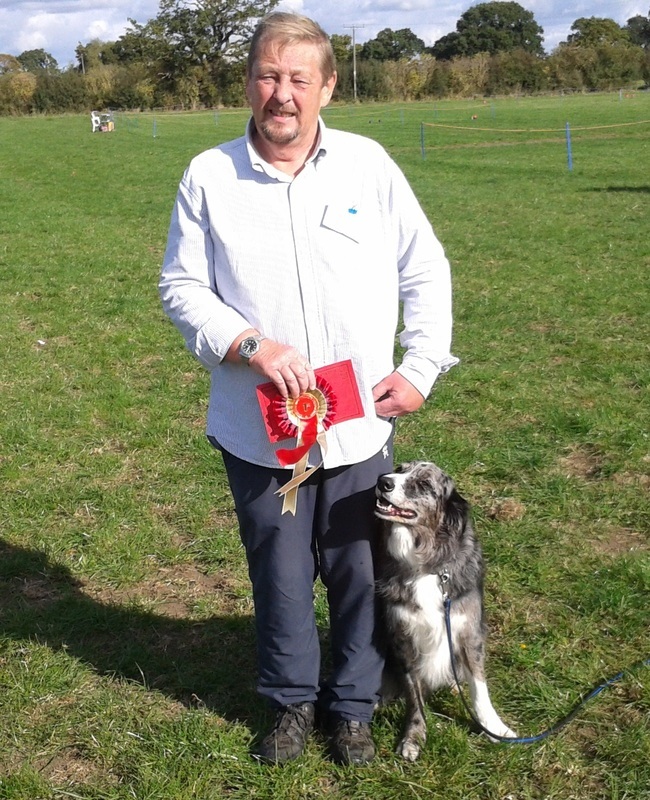 He was a star at dog school and won many prizes at our progress tests and at the obedience shows Anne attended. In later life he became very well known along with all the dogs at Cafe Rouge in Chester as Anne and Mike walk all the poodles through the city. 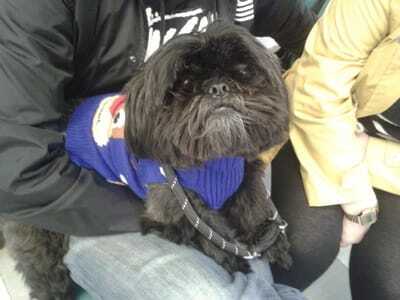 He was a much loved dog and will be missed greatly by all who knew him. Our sympathy goes to Anne and Mike. 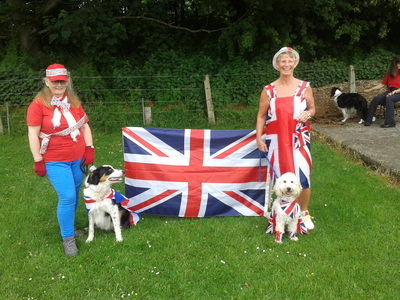 ​We done to you both, you really deserve your success after all the hard work you put into your lovely dogs. We are so proud of all our pupils. 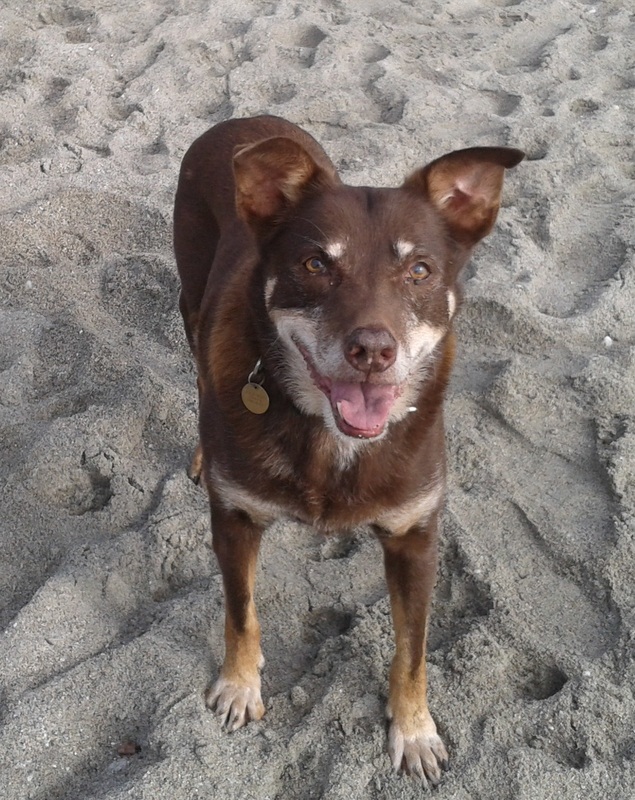 It is with a heavy heart I have to report the passing of our wonderful Kelpie Dingo. He put his heart and soul into his tracking and searching and just loved to work, we went through so much together traveling all over the country competing, we are so proud of all he achieved. 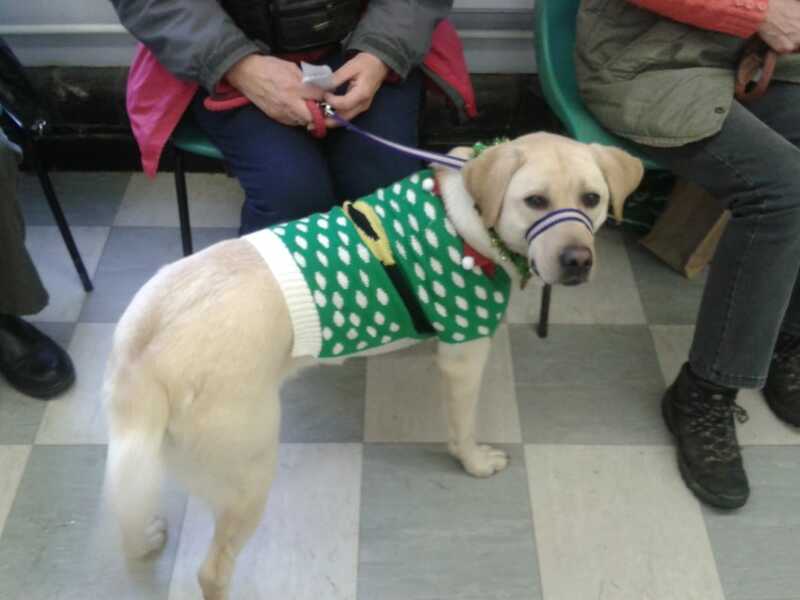 He turned from a very naughty puppy into a wonderful dog, always willing to work or play and join in with anything that was going on at home and at our dog school. We love him and miss him so much. Till we meet again lad. 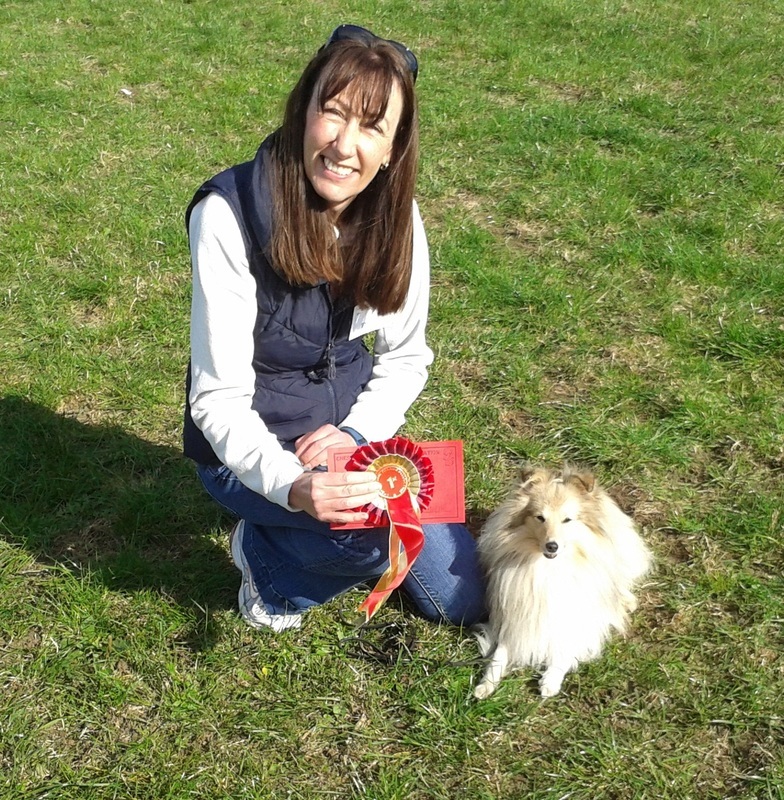 This is wonderful news, Kerry and Belle will now go forward to the semi final held in Scotland later this year and if they do well which I am sure they will, be invited to compete in the final at CRUFTS 2017. Well done to you both you deserve all the success and I am sure you will do fantastic. WOW! What a lot of prizes our small group have taken home this weekend. Colin and I are very proud of all our pupils. We must all be doing something right! 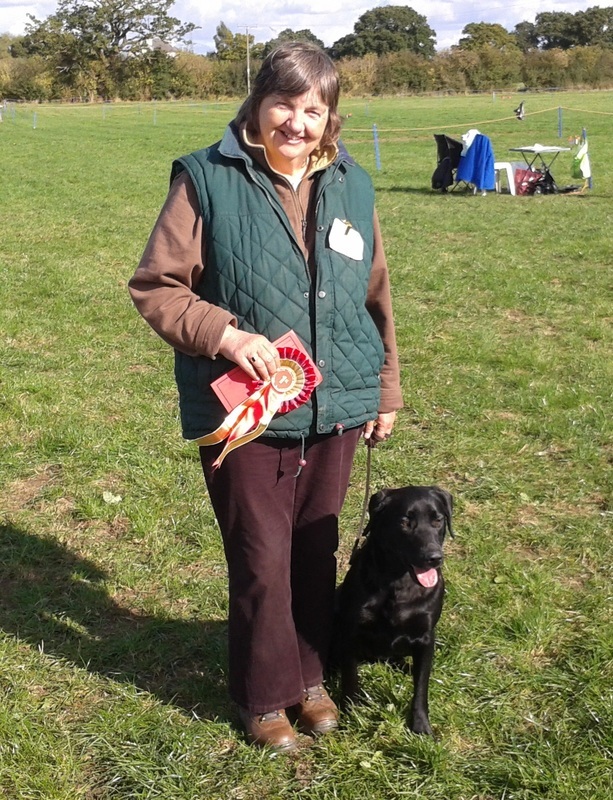 You must be so pleased with your lovely black Labs, Ebony is having a really good year so far and Gelert doing well in obedience and working trials even though he is still only young and needs time to mature. Well done today to our super pupils for performing yet again a wonderful display of obedience for the crowds at Rhydymwyn fete. We have been doing a display at the fete for many years and have always had a lovely welcome and good interest from the community. 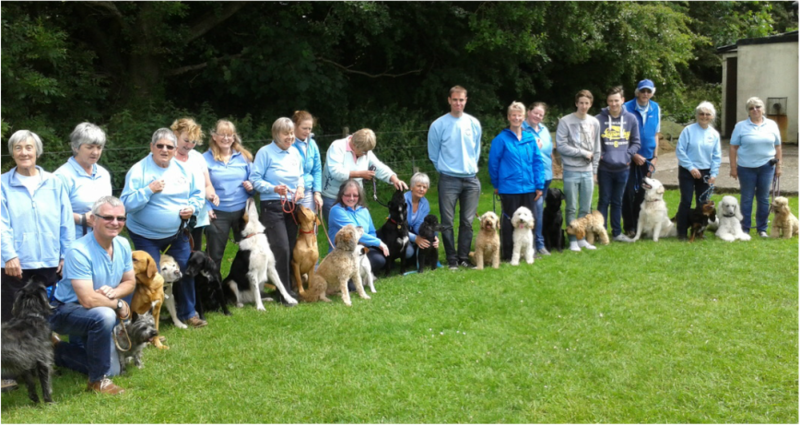 ​Everyone looking happy after the display today. ​What a good start for you both, we are very proud and look forward to your cakes to celebrate. After the fancy dress parade we had some dancing then a lovely picnic outside, then we had a race and then fastest sit, down, stand. Then the rain came and we all went into the hall and had a quiz about the royal family which was very interesting. Thank you to everyone for taking part. We are so very proud of all our pupils, all the hard work we put into the dogs and their handlers has paid off, keep up the good work and we look forward to celebrating with you on Saturday at class. You are both so consistent I am sure you will win your class soon. Just keep on doing what you are doing and you and Belle will have your day. THIS YEAR WE HAVE BEEN RUNNING OUR DOG TRAINING BUSINESS FOR 20 YEARS WE WILL BE CELEBRATING WITH ALL OUR FRIENDS AT CLASS, MANY WHICH HAVE BEEN TRAINING WITH US FOR MANY YEARS. IT DOES`NT FEEL LIKE 5 MINUTES SINCE WE STARTED AT RHYDYMWYN MEMORIAL INSTITUTE THEN EXPANDING INTO HOOLE COMMUNITY CENTRE AND FINALLY INTO WREXHAM STARTING AT HOLT ROAD AND NOW AT ST JOHNS CHURCH HALL RHOSNESNI, IT TOOK US A WHILE TO GIVE UP OUR DAY JOBS WITH THE POST OFFICE TO FOCUS ON OUR TRAINING CLASSES FULL TIME BUT WE HAVE ENJOYED EVERY MINUTE OF OUR CLASSES WHICH HAVE EXPANDED OVER THE YEARS. WE HOPE TO CONTINUE FOR MANY MORE YEARS. This is their first trial as Gelert is only a young Lab so its great that all your hard work has paid off. CONGRATULATIONS to all our pupils who competed at our spring progress test today. 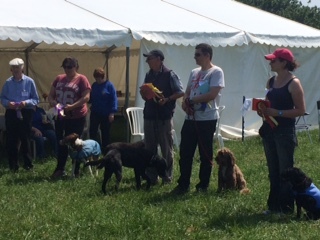 Although we had some rain all day there was a good show of dogs doing their best and owners enjoying the experience of competition! 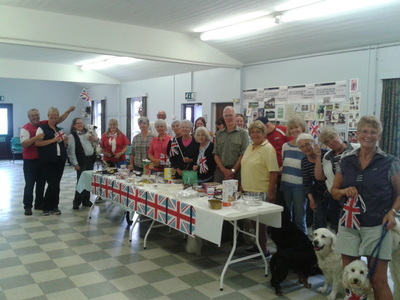 It was a lovely day, we all enjoyed some lovely food especially the egg butties and the now famous trifle. May thanks to our judges Carol Rowlands and Janet Rimmer. 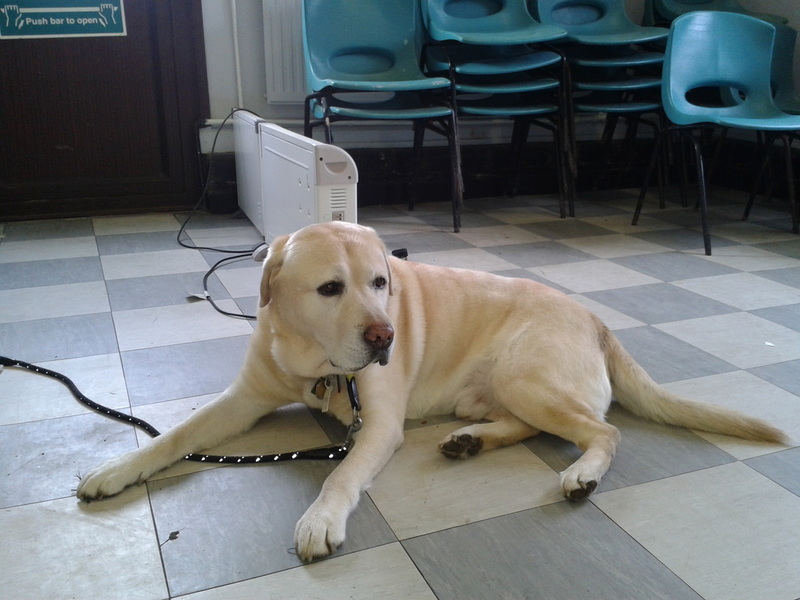 We are very proud of our wonderful pupils and their lovely dogs. 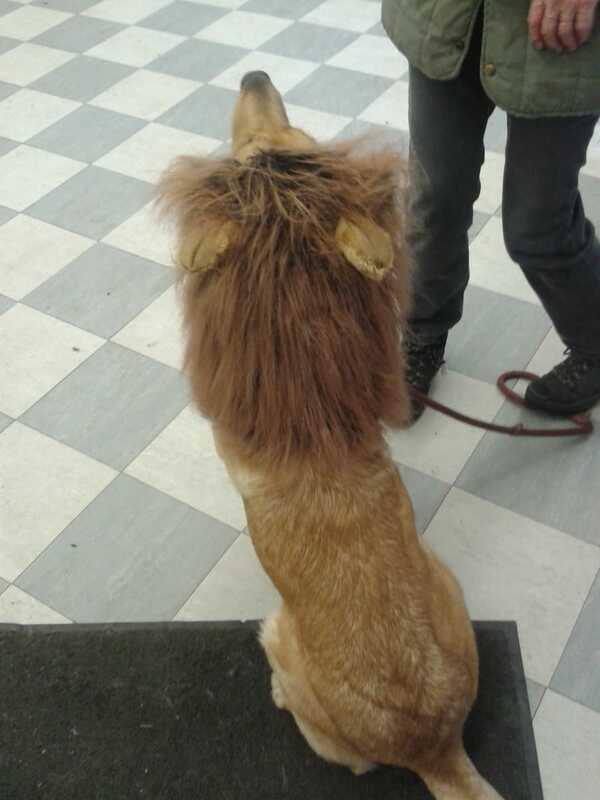 and he was so well behaved! We are very pleased to announce that EMMA AND BARNEY gained 3rd place for WALES at the CRUFTS INTER - REGIONAL OBEDIENCE COMPETITION HELD AT NEC BIRMINGHAM. 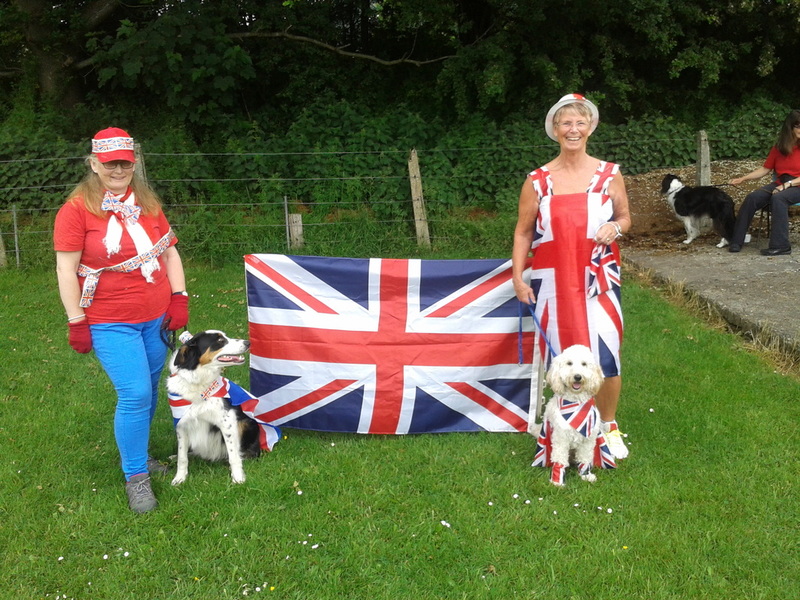 We all went down to support the team and really enjoyed seeing Emma and Barney strut their stuff on the green carpet, they were brilliant, all the training has paid off. We had a lovely celebration at class on the following Saturday, Emma brought their rosette for everyone to see and we awarded a lovely memento rosette to mark their achievement. 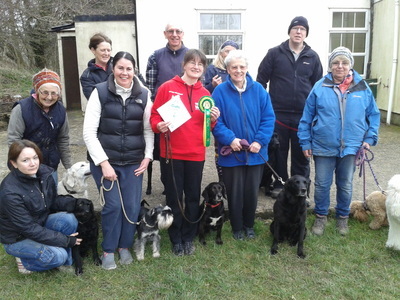 Colin and I are so pleased and proud of Emma and Barney as Pat spent her showing career with several of our dogs representing Wales at Crufts and its lovely to have one of our pupils appear there. 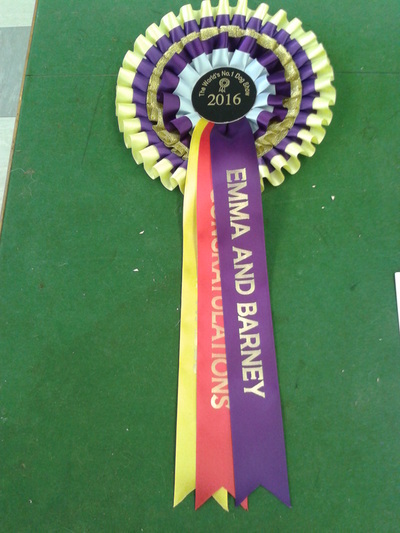 Some lovely photos of Emma with Barney with their rosettes, some friends at class, and in the big ring. Two lovely oldies - on the left is Barney who is about 14, he and Barbara joined us many many years ago as a rescue dog needing help with his behavior and became one of our stars in the class. We love to have a visit from them both now and again to catch up on the news. 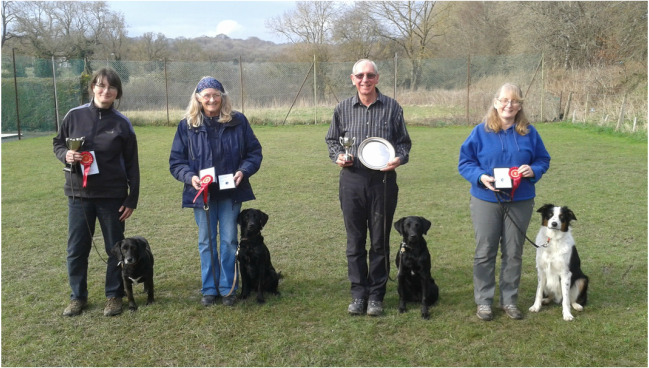 On the right is Kirk - again joined us many years ago with another Barbara, they have both enjoyed their training with us and are still attending. He is celebrating his 11th birthday in this picture and we all had homemade cake for a treat. We are back in wet soggy Wales! it was so lovely to see everyone at class today and hear all the news. There was a round of applause for our good friend Anne who runs the Saturday class for us while we are away, we are very grateful for your help and we know how much you enjoy doing the training. All classes are now back to normal, we look forward to meeting all the lovely dogs we have booked onto our courses and helping with their training. ​Also the trophy for the fastest search for 4 articles! Ebony in now 10 years old and has always enjoyed her work, she had a wonderful day out of retirement and a good sleep when she got home! ​Well done to you both. This is wonderful news and we very much look forward to supporting you and the team on your special day. 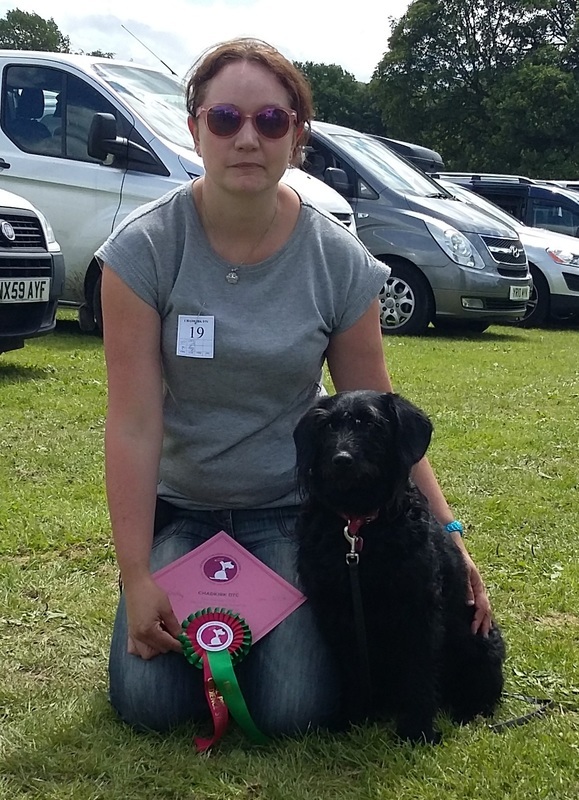 Emma has been training with us for some time now with all 4 of her dogs and has become very interested in competitions where she and Barney have won many prizes including winning out of pre beginners last year. They both very much deserve this opportunity to strut their stuff on the green carpet at the biggest dog show in the world! 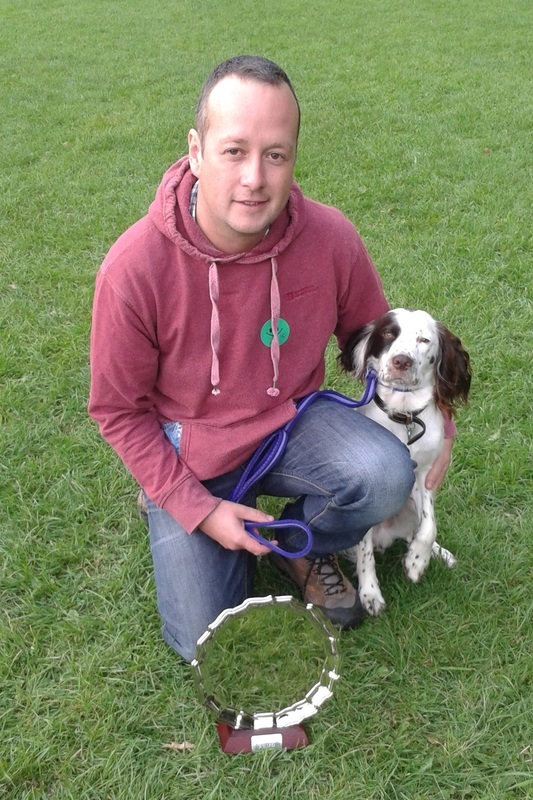 We are very proud of all your achievements so far as Len and Ashin are new to obedience and has had a lot to learn! but they both try very hard, we look forward to helping you advance. We are enjoying our winter break in Nerja and will be back soon. 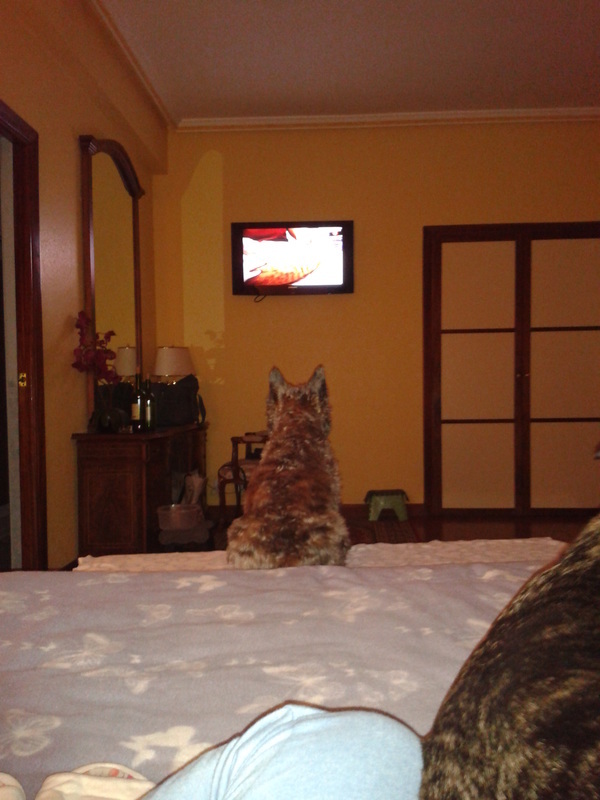 Pictures of Bodie watching TV and Colin with the dogs on Christmas day!